Semacode – 望み – What is that you desire? Semacode is a private company and also this company’s trade name for machine-readable ISO/IEC 16022 Data Matrix symbols which encode internet Uniform Resource Locators (URLs). It is primarily aimed at being used with cellular phones which have built-in cameras. The Data Matrix specification is given by the ISO/IEC 16022 standard. That’s the reason for that two-dimensional barcode which looks like a dense crossword puzzle found in websites. 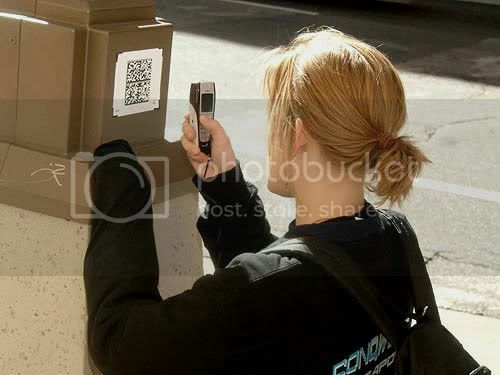 QR Code is the primary form (preceding semacode). It is basically a higher generation barcode. It can contain not only URL, but also other data — it is possible to encode pictures in them, as well as Japanese characters. It is advantageous because it can take up less area than a barcode for the same data storage, and has error correction built into it so even if a part of the picture is obscured, the correct data can be extracted.